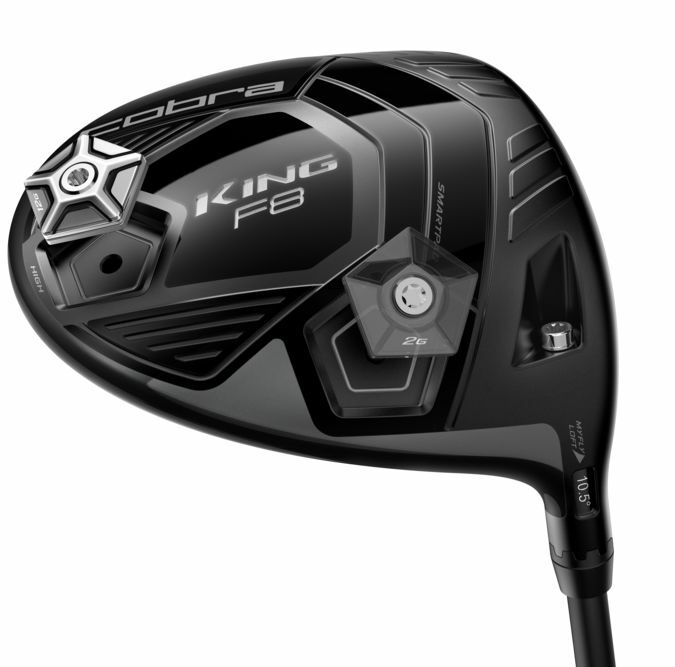 Cobra King F8 and F8+ driver review: Cobra employ groundbreaking new technology in 2018 - but does it work? Cobra’s King F6 driver was a GolfMagic favourite, picking up numerous accolades throughout 2016. We were fans of the F7, but didn’t see a massive progression from what had come the year before - that cannot be said for the KING F8 for 2018. Ever heard of nardo? Neither had we. Apparently it’s big in the luxury car market - that will be why we were unaware then. It’s a beautiful colour, reeking of premium. It contrasts spectacularly with the black face. The carbon adds to this moneyed aesthetic. We didn’t have a problem with the air trips on the crown, but players that prefer a more traditional look at address may have issues. This is a funky, modern, but classy-looking club. The F8 is large and confidence inspiring at address, while the F8+ has a smaller profile. A definite improvement on the F7. A little softer - just a tad - but a lot more responsive across the face, which gave us confidence. Cobra say the first Precision Milled Forged Face on a driver in golf and the air trips should improve ball speeds and club head speeds for extra distance in 2018 - and we conquer. On average, we were getting up to five yards extra on the F7, and on occasion even more than that. Ball speeds and club head speeds were also both improved compared to 2017. Bravo! The F7 was a forgiving driver, and while there isn’t a massive improvement in this department there didn’t really need to be. It remains a very forgiving driver! Regarding spin, the F8+ driver was spinning 2-2,500 less than the F8, and the launch angle came down by around 4-5 degrees. Changing the weight into the draw bias setting in the F8 driver allowed us to easily hit a draw when required, but we were also able to hit it straight when needed. Flipping the weight to the front in the F8 driver was taking our spin down by up to 800. Cobra Connect returns for 2018, and it's a system we enjoy using. Simple, effective, and easy to navigate. The only issue we've run into is older phones can have battery issues. Cobra’s biggest challenge will be getting more players to try out their F8 drivers - because if they do, they will sell a lot of them. At a competitive price and one of the best performing drivers on the market - they are attractive products. Make sure you give it a test in 2018!